The Freed-Hardeman Lectures begin today in Henderson, Tennessee. This is the 77th annual lectureship sponsored by the school. The theme for 2013 is We Will Serve the Lord:Conquest and Deliverance in Joshua to Ruth. Each year, for the past several years, the school focuses on one section of Scripture for the lectureship theme. Other topics are discussed as well but the keynote addresses focuses upon the theme. Next year the theme will be The patience of Hope: First and Last Things in Thessalonians. As an alumnus of Freed-Hardeman I try to attend every year and have done so for the past 12 or 13 years. The reunions with old friends is always a highlight. As in recent years we will be posting from the lectureship. You can be a part yourself by visiting the lectureship website. Streaming video is offered of many sessions and of the afternoon Open Forum conducted by Dr. Ralph Gilmore. The forum tackles questions offered by the public and allows questions and comments from the audience and via email submission. Of course the forum is not an official church of Christ decision making body. 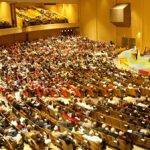 The churches of Christ are all autonomous and have no earthly headquarters Nevertheless, the forum serves to stimulate thinking and study for all who are present. Jay Lockhart will be honored this year and the Lectureship is dedicated to him. Jay ministers will the Whitehouse church of Christ in texas and is currently on the school’s board of trustees.